that is pretty incredible. Regardless of pace, the 26.2 distance is a challenge and at that age phew! I was gonna get up and watch him (the marathon passes within 10 minutes of my hose) but I was too tired. Pretty sad, eh? Amazing! Hoping that I can run a marathon period...let alone at 100! He is definitely an inspiration at all. He's just proven anything can be accomplished no matter your age. The death of his son and earlier of his wife forced him to search for an alternative in life worth living for, his coach Harmandar Singh said. ''Running has given him a new focus in life," he said. And again, to put this in perspective, he was born BEFORE WWI! Howard Taft was President, and there were FOUR presidents in between Taft and FDR. He has been around a l-o-n-g time. Omg..he is 'the' man. Most can't take a leak at 100 without help and this guy runs for 8 hours? It is true - if you can think it, then it's doable. 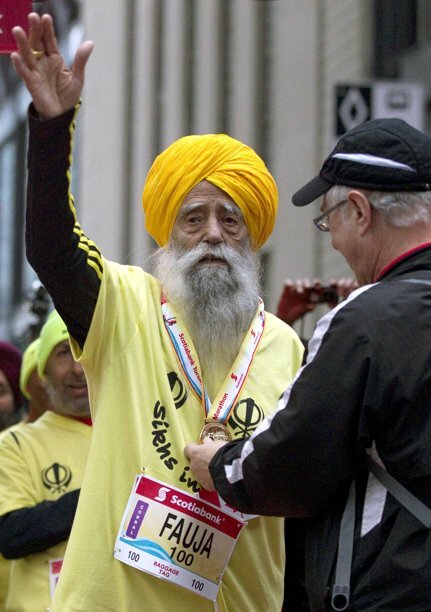 Marathoner at the age of 100! That is unbelievable! I mean these days people won't even think of running that long distances at the age of 40 years. Fauja Singh- you are simply INCREDIBLE! Man this is a great piece of inspiration. I hope I am still kicking when I am 100 and be able to keep doing marathons. Very impressive! Hey, I am from frankfurt, Germany, and i am going to run my first Marathon in april 2012. Running is the best Fitness training ever.I love also railrunnig! !